I have divided this cooking class in four lessons, each of which focuses on a different country. During this unique cooking class, I will teach you in a playful way the basics of Balinese, Sri Lankan, Thai and Vietnamese cuisine. In case you think this is too much, you can also book a separate lesson. With the recipes you receive afterward, you can do it all over again and surprise everybody at home. Does this course sound like music to your ears? Scroll down for the details per lesson and to register. This cooking class consists of four lessons. Per lesson, a different cuisine will be highlighted. The lessons can also be booked separately. Scroll down for lesson details. Between ±6 pm and 10.30 pm. When you think of Bali, you probably think of great weather, surfing, temples and breathtaking rice fields. But the island also offers delicious dishes. During the lesson, you will get acquainted with the herbs and spices of Bali. Also, I will explain various cooking techniques. We will make the best stew Bali has to offer and also I will show you how to prepare a tender satay. A typical meat dish on a stick. During cooking, we divide the tasks. Afterward, we will enjoy the tasty dishes we have prepared together. Before you leave, you will receive all the recipes to bring back home. Sri Lanka’s national dish is unmistakably rice and curry. In an Shri Lankan restaurant, you will find a man at the stove. However the best curries are made by housewives, so you can only eat these at there homes. During this lesson, we will prepare a typical Sri Lankan meal including rice, various curries and side dishes such as a shrimp curry, a mango curry, and a fried eggplant dish. Vietnam has a surprisingly delicious cuisine. We all know their rice and fish sauce, but the Vietnamese also use many herbs and spices that transform every dish into a feast for the mouth. Whether you eat a banh mi or grilled salmon with pepper, you will always be positively surprised. During this lesson, we work a lot with fresh vegetables and make the typical Vietnamese spring rolls. Also, we will make a dish with squid and I will teach you the special taste of caramelized pork. Specific to Thai cuisine is to combine all five flavor sensations in each meal, which is spicy, sour, sweet, salty and (possibly) bitter. 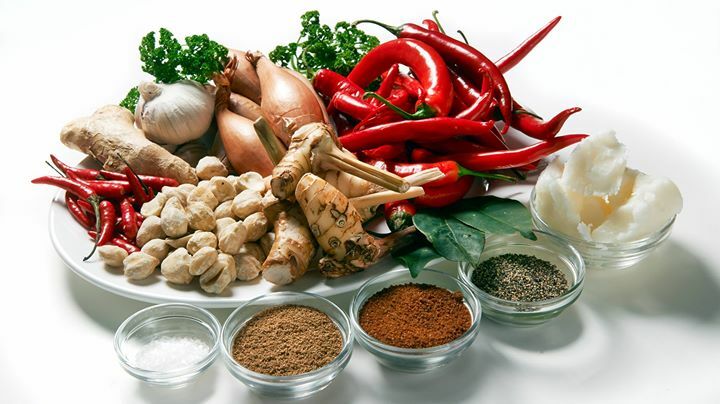 But also the use of large quantities of fresh herbs is typical for Thai dishes. During this lesson, we will prepare the characteristic Thai fish soup as well as fish biscuits, and I will teach you how to make a delicious curry stew. During cooking, we divide the tasks. Afterward, we will enjoy the tasty dishes we have prepared together. According to good Thai custom, all the dishes are served in one go enjoyed at once: The best way to experience all the different flavors at the same time. Before you leave, you will receive all the recipes to bring back home.